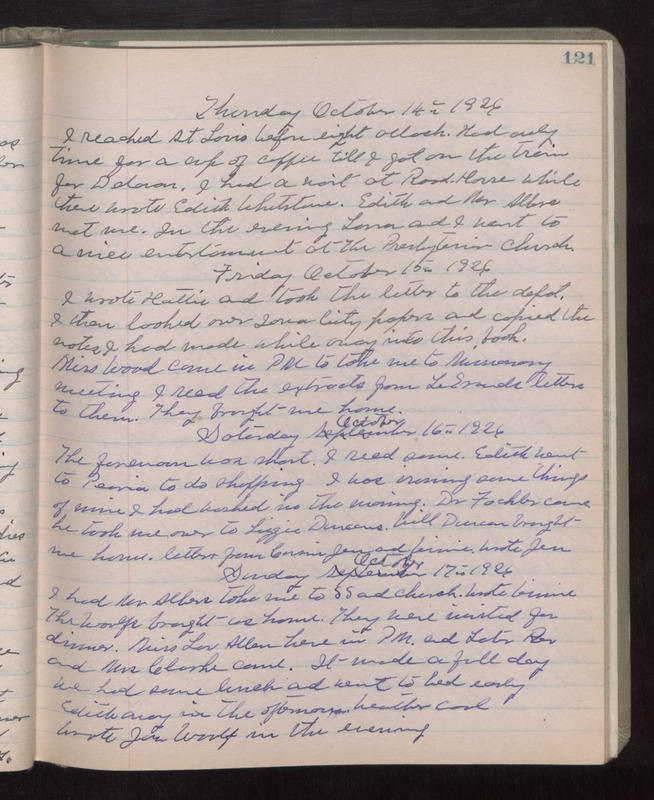 Thursday October 14th 1926 I reached St Louis before eight oclock. Had only time for a cup of coffee till I got on the train for Delavan. I had a wait at Road House. While there wrote Edith Whetstone. Edith and Mr Albers met me. In the evening Laura and I went to a nice entertainment at the Presbyterian Church. Friday October 15th 1926 I wrote Hattie and took the letter to the depot I then looked over Iowa City papers and copied the notes I had made while away into this book. Miss Wood came in PM to take me to Missionary meeting. I read the extracts from LeGrands letters to them. They brought me home. Saturday October 16th 1926 The forenoon was short. I read some. Edith went to Peoria to do shopping. I was ironing some thing of mine I had washed in the morning. Dr Fachler came. He took me over to Lizzie Duncans. Will Duncan brought me home. Letter from Cousin Jen and Winnie. Wrote Jen. Sunday October 17th 1926 I had Mr Albers take me to S S and church. Wrote Winnie. The Woolfs brought us home. They were invited for dinner. Miss Lou Allen here in PM and later Rev. and Mrs Clarke came. It made a full day. We had some lunch and went to bed early. Edith away in the afternoon. Weather cool. Wrote Joe Woolf in the evening.